Exceloft now consists of 3 unique and highly specialized polyester fibers. 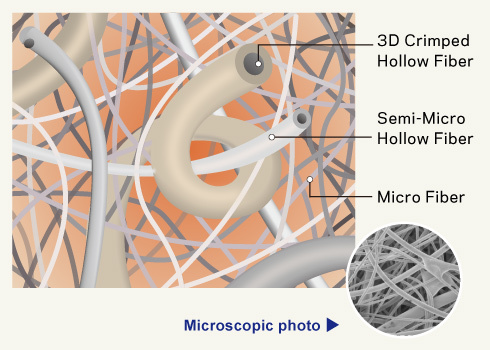 By selecting specific fibers that vary in shape, diameter, and composition we promote improved structure, greater flexibility, and increased multiple random air strata. The greatest points are seen in insular value with the addition of a third fiber and the resulting increase in micro pocketing. In addition, we have bonded these fibers at each point of intersection to create a structural “spring effect” that improves resilience and speeds loft rebound. By achieving extreme loft resilience, it helps maintain high loft even after repeated compression cycles. Featured with dual functions of loft resilience and heat retention, it enhances the effects of both the crimped hollow fiber and micro fiber. The micro fiber is densely filled to capture ample warm air. The fiber is very soft and creates a lofty feel. Compared to some synthetic insulations of equal weight, EXCELOFT® achieves the highest Clo Value (a measurement of thermal insulation). EXCELOFT® is highly packable, while maintaining loft after repeated compression cycles. EXCELOFT® maintains thermal properties by utilizing hydrophobic silicone impregnated fibers that retain less than 1% of their weight in.